We know that there are hundreds of sub-factors that influence rankings, but these are the big three. So what do we know about each one? Content: Content that Google is looking for is valuable to the user. It provides answers to questions and is a resource to its reader. That’s the message here – be a resource. In-depth content that covers a topic will win out over keyword “rich” content. In an example given, think about the search for “best fertilizer”. In the old days of SEO, the content that wins out might have a higher keyword density, and use the term over and over again. But Google is starting to understand the searchers intent (through RankBrain), and knows that you could actually be looking for “cheapest fertilizer” or “most popular” or “most effective”, so the content that will win out will provide a better resource for fertilizer that discusses all of these. Attack all the commonly asked questions, and give the user what they are looking for. Build pages that are great resources. Links: Links are important because of several reasons. They are signals that your website is worth a link because you may provide content or additional information that is valuable to a user on another website. The topic of the page that links to you can also add weight to your relevance about that topic. 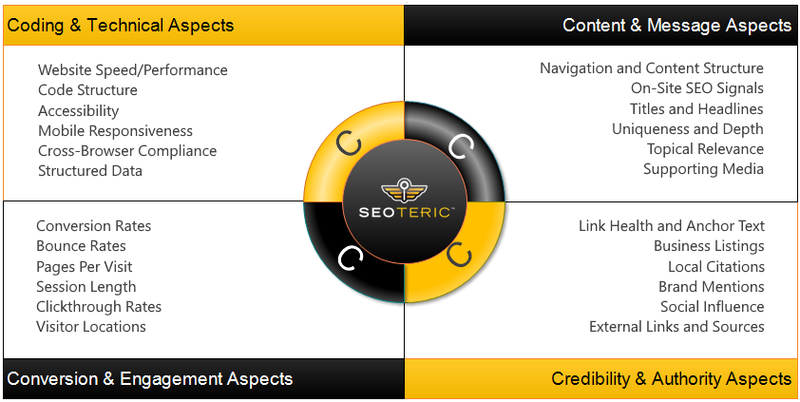 Links also pass authority and trust signals that give your website importance and credibility. Anchor text (when not over-optimized) gives important signals about what your website or pages are about. A link passes PageRank, and is a transfer of authority and credibility. How pages link to you and what websites link to you is important to Google because it helps identify the types of websites that find you important. If the links are from lower quality websites then you are not seen as very credible. If your links come from relevant and higher authority websites then you are seen as more credible. Google wants to provide its users with the most relevant content from the most credible source. RankBrain: RankBrain is the artificial intelligence engine that is a part of the algorithm. RankBrain learns how users interact with search queries and the search results to best understand the intent of the search query and to return the best result. It is arguable the most complicated part of the search algorithm, and you can see a full FAQ here on what RankBrain is. Google even admitted to not knowing what RankBrain actually was doing because it learns and adjust itself based on interactions and machine learning technology. If we know so little about it, how can we possible influence it? I think that comes down to how users interact with your website. If you start with the right kind of content that is a resource for users, and you acquire links from relevant and quality sources, then you are already influencing RankBrain to an extent. RankBrain is learning what searchers want by how they interact with the websites that they visit from search queries, so the better you are as a resource, the better you’ll do long term under RankBrain. You want to work on engagement and conversion metrics to make sure your audience is engaged. Our Four Pillars of SEO cover the areas that we need to influence to have a positive affect on the core ranking features that Google is looking for. You can’t overlook the technical aspects of your website, as that can derail any content or link acquisition efforts, so we look at the entire picture to give the best chance to rank well now, and in the future. Here is another look at the Four Pillars of SEO.